The government is looking to cap premature provident fund withdrawals at 75 per cent for EPFO subscribers at any given time till the age of 58. 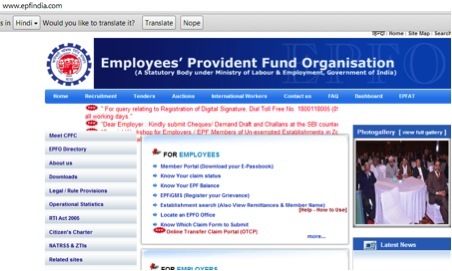 Under the existing provisions, Employees Provident Fund Organisation (EPFO) subscribers can withdraw the entire amount by showing not employed anywhere for two months. The proposal regarding changes in 'The Employees' Provident Fund Scheme' has been sent to the Labour Ministry for approval. The move is aimed at discouraging PF withdrawal and boosting post-retirement social security benefits of workers. "We have to create an incentive for keeping PF money till retirement and not withdraw it in between. We have proposed the 75% cap to the labour ministry, which is expected to approve it in next 15 days," said Jalan. A labour ministry official, requesting anonymity, said that EPFO would like to eventually bring down the cap to 50% of the PF deposited. Tax deduction at source on premature withdrawals—within five years of contribution—announced earlier this year is a step in that direction, he said. "The effort is to motivate people and put in place legal provisions for a better social security corpus in old age," said Jalan. Every year, nearly 13 million applications are received for withdrawal of PF money, of which more than 50% are for 100% withdrawal, the PF commissioner said. Once the labour ministry approves the EPFO proposal, this number is expected to fall to 5 million. Jalan explained that other than better social security, the measure will allow the Universal Account Number (UAN) to continue despite switching jobs. Hits: 794, Rating : ( 5 ) by 1 User(s).